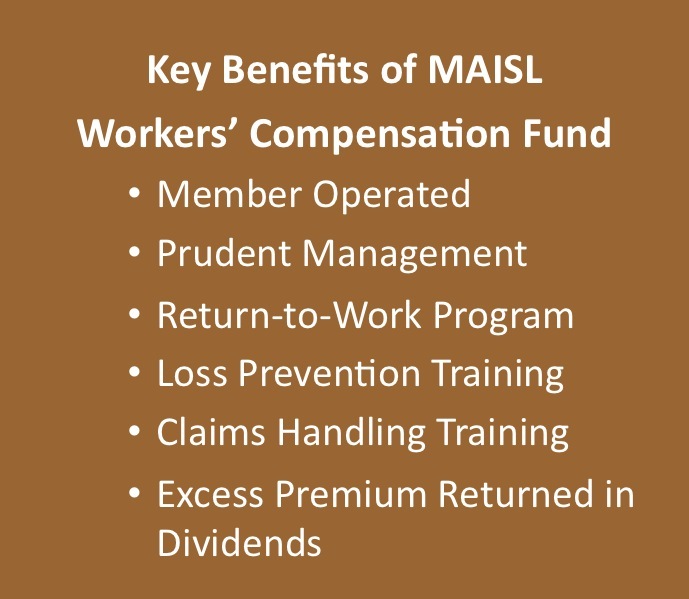 The MAISL Workers’ Compensation Fund is a workers’ compensation risk sharing pool operating by authority of MCLA 418.611. This program was founded in 1993 for school districts seeking a more economic alternative to their existing workers’ compensation programs and greater year to year stability of costs. In establishing this program the Fund has combined the group purchasing power of multiple districts with the expertise of its business managers. Further strategic and tactical support is provided by carefully selected insurance agents, consultants, attorneys and claims administrators. The Fund program dedicates a major portion of member contributions to a shared loss fund as an alternative to traditional commercial insurance. This Fund is supported by excess coverage from Safety National written at statutory per occurrence limits. This coverage responds to catastrophic occurrences and provides stop loss coverage to provide protection against an excessive accumulation of losses in any individual program year. Consistent with Department of Labor regulations the program is fully funded up to the attachment point of its stop loss coverage. The Fund operates with a board structure that assures each district has a voice in the operation of the Fund. The Fund Board meets five times a year, with each district in attendance having a vote on key issues. As a result, the Fund remains sensitive to the needs of its members. The Fund works with its members to reduce losses and deliver services as economically as possible within the framework of prudent management. To achieve this objective, the Fund oversees a Return-To-Work Program and conducts periodic training in loss prevention and claims handing. The Fund also utilizes a Managed Care Program to reduce costs. Results of the program have consistently earned dividends for its members. The Fund has accelerated the return of dividends to its members while reducing its outstanding claims.